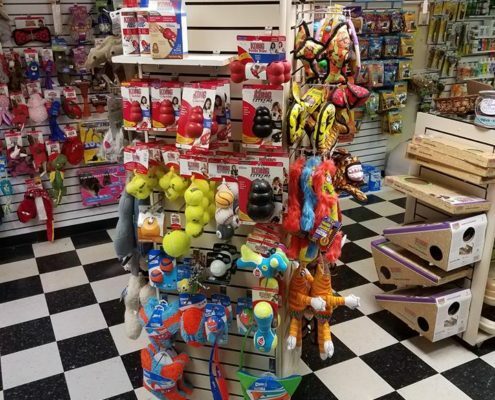 Local Pet carries a wide variety of toys and accessories. We all like to play and enjoy recreational time… our pets are no exception. And in truth, buying toys for your pet will offer benefits beyond plain and simple fun. Toys help to keep your pet mentally as well as physically active, and channel excess energy away from destructive behavior patterns. Some toys can even promote dental health. The selection of toys is vast with many popular brands to choose from. We have multiple brands of durable plush toys. Fluff & Tuff offers a wide variety. Little lady bugs, up to “giant” gators that squeak. Re-enforced with webbing under the plush exterior helps keep these toys lasting longer than the standard plush toy. Lobsters, walruses and flat buffaloes OH MY! Just a glimpse at the variety HuggleHounds bring to the soft toy family. Plush toys that are even tougher, is the Tuffy. These plush toys go to extreme lengths to make their toys extra durable. Which includes 3 layers of materials being sewn together with 1-2 rows of linear and cross stitching. Not everything is soft toys. This is why we enjoy the variety of Kong toys. Yes, they do include soft toys but range from their well known rubber toys, to their squeaky tennis balls and outdoor interactive toys. Speaking of outdoor toys. Chuckit! compliments this space nicely with their ball launcher and Frisbee. Chuckit! also has a fuzzy Frisbee for indoor play, which is helpful for those rainy days. If your cat is a lover of catnip, have you found the right place! We carefully pick out the best catnip toys one can find. Ratherbee El Gato catnip cigars is a favorite of cats due to the potent catnip and compact design for carrying. 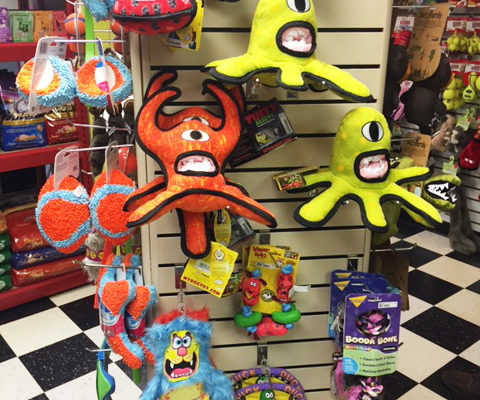 Pet Candy has a fun variety of catnip toys that come in different shapes and patterns. More of a mild catnip compared to Ratherbee but still high quality. Yeowww! Catnip does well being silly. Having apples, lemons and rainbows catnip toys is plain funny when you see your cat wrestling with one on the floor. After all of this stimulation, your cat may need a place to chill out for a little. We suggest getting your feline companion a hand crafted cat tent to hide in and take a nap. If your cat needs something a little more structurally stable. We have different cat towers and furniture to choose from. Sometimes something a little more specific is needed and we can accommodate that a special order. Call us with the details and we can help you out. 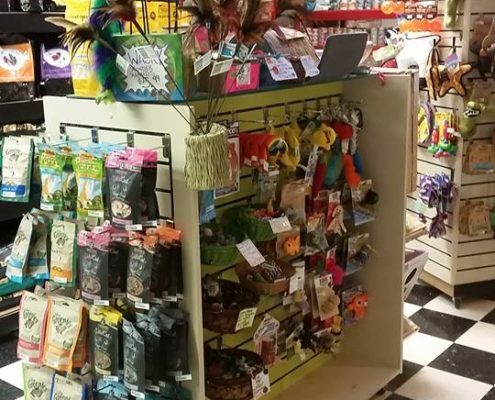 In addition to play time products, Local Pet also offers a great selection of pet accessories for your pet. Plastic Bowls. They are durable and long-lasting. However, if you notice your dog gnawing or chewing on the bowls, plastic isn’t your best choice. Which your dog could potentially ingest bits of plastic that might do harm internally. Ceramic Bowls. 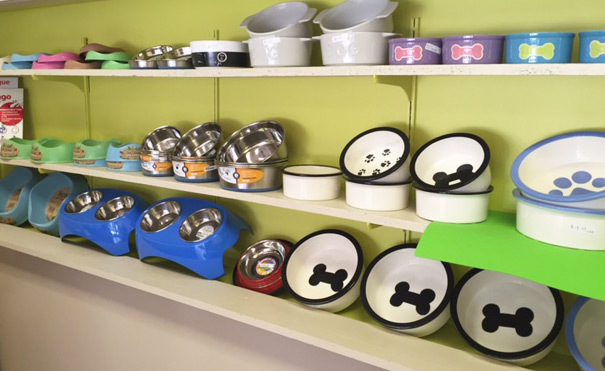 They are heavy and very stable – a good thing if your dog tends to push its bowl around the floor while eating. However, ceramic bowls are porous. Which means the bowl will need cleaned on a daily basis. Stainless Steel Bowls. The #1 choice of vets because they are so easy to clean and sanitize. In addition, stainless steel bowls are obviously the most durable. Look for bowls with a rubber coating on the bottom to help prevent sliding.